The ambiance at the Villas Paradis is blissfully tropical. The beige and white tones, added to the lush green vegetation and the blue of the Indian Ocean, promise a fresh touch to its guests. The synergy between the interior and the outdoor is subsequently enriched. 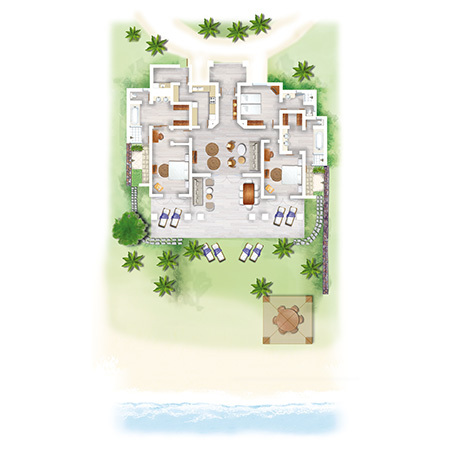 These beach accommodations and their living space of 275 m² offer luxury, space and comfort to their privileged residents. The entrance of the villa opens on a living room that leads up to a lavish terrace covered with a thatch roof. The outdoor furniture was carefully chosen to enhance moments of relaxation in family or alone. On the deck, a dining area and a living area, are the ideal spots for a refreshing drink at the end of the day. Villa Paradis has three amazing bedrooms, each with a private bathroom. Two bedrooms are equipped with double beds and the third bedroom has twin beds. The bathrooms are equipped with showers and large bathtubs. Two bathrooms also have outdoor showers set in miniature gardens. In the living room, the sophisticated equipment is a comfort bonus with its DVD player and flat screen. Each villa has a fully equipped kitchen. Located on the spectacular peninsula of the Morne, these dream villas have access to the beach and private gardens as well as all the facilities of a 5-star resort. A private valet and golf cart are also available for each villa (service of a Chef on demand).